Hey all. Welcome to day three of the Great (Post) Holiday Give! 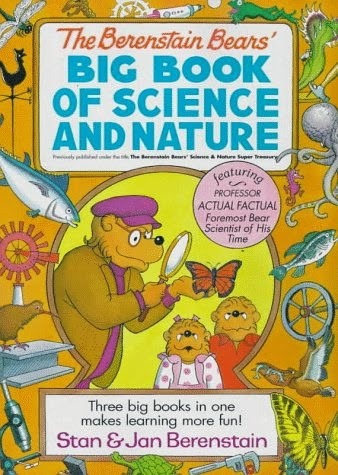 The give today is The Berenstain Bears' Big Book of Science and Nature. Dover has reprinted my three favorite Berenstain books into one giant volume: The Berenstain Bears' Almanac, The Berenstain Bears' Science Fair, and The Berenstain Bears' Nature Guide. Nothing like the thin, morality paperbacks that make up the bulk of the Berenstain backlist, these books from the 1970s were massive tomes filled with busy illustrations, chock full of all sorts of useful nature and science information. Sooooo without further yadda yadda yadda, I will be giving away one copy of this fat book of awesome. To be entered to win a copy, simply comment on this post by 11:59 PM CT Wednesday, January 7. The winner will be announced the next day!!!! My son loves the Berenstein Bears and is a mini scientist! This would be perfect! We'd love to win this one! You always have so many great vintage kids' book suggestions! Wow! This book looks good! Thank you so much for all the great giveaways! I'd love to be entered, my son is due to arrive anytime now :). This looks like a good compromise. My kids love the Berenstein Bears, but I can't stomach the overt moral lessons in each of the paperbacks. This one, though, looks interesting. I remember the heck out of this book. Memory flood!